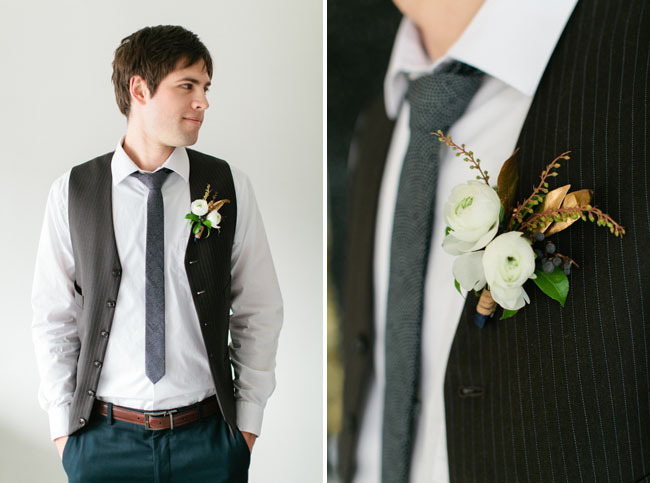 What groom (or even bride!) doesn’t love Star Wars, right? 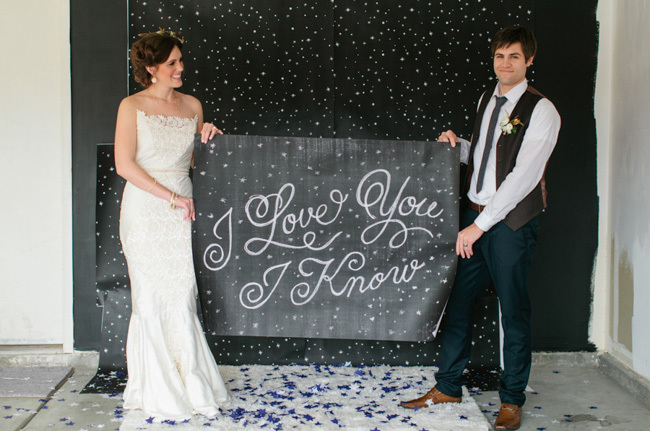 And I’m sure when you think of a Star Wars inspired wedding, you are thinking – ugh, so cheesy! 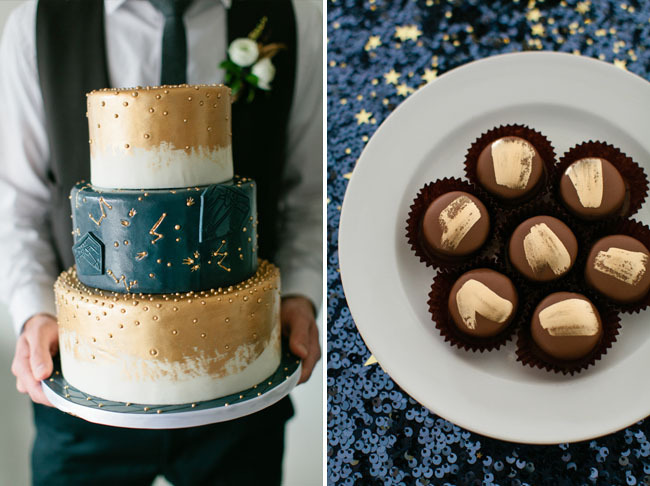 Well, with a modern take on Star Wars, this shoot proves that you can include your future husband’s interests in your wedding without being corny! 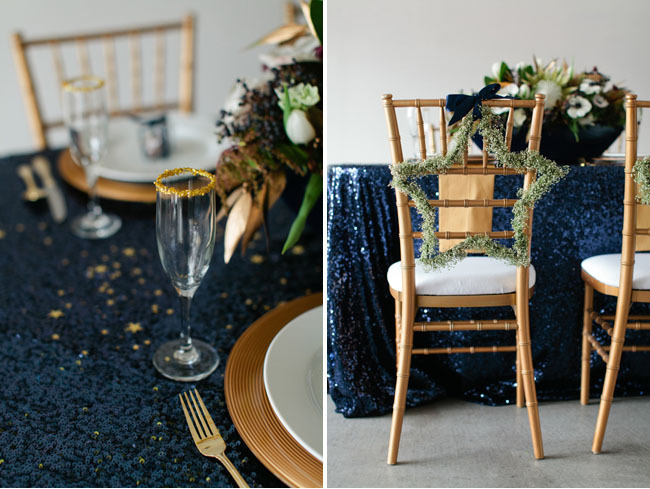 Filled to the brim with subtle Star Wars details, this shoot is sure to please both bride + groom with it’s modern take on the films. 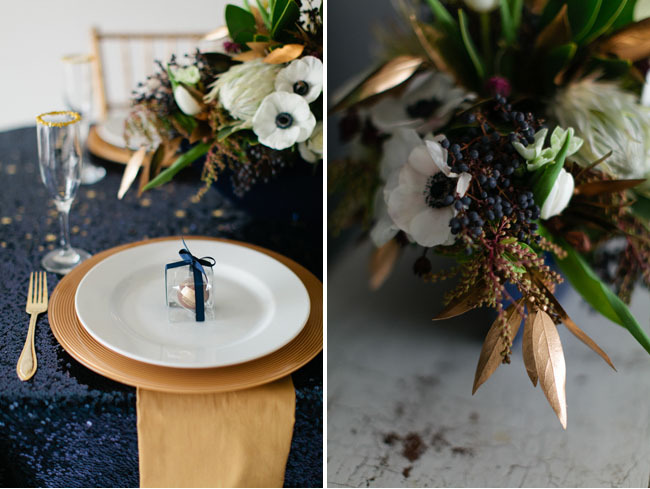 Love all the touches of dark navy blue, gold, and white with hints of black and yellow. 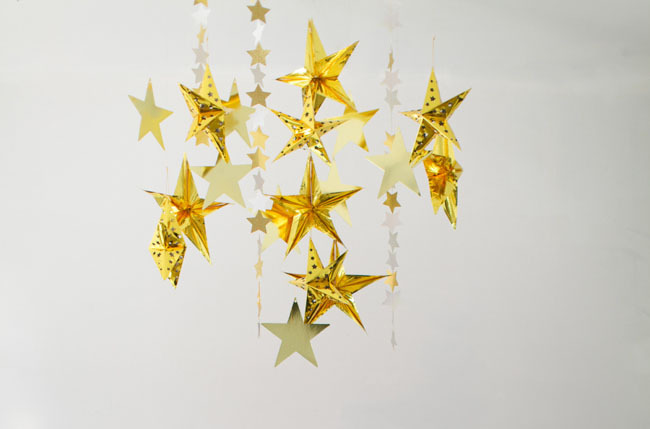 Stars are another fun motif, being it was STAR Wars. 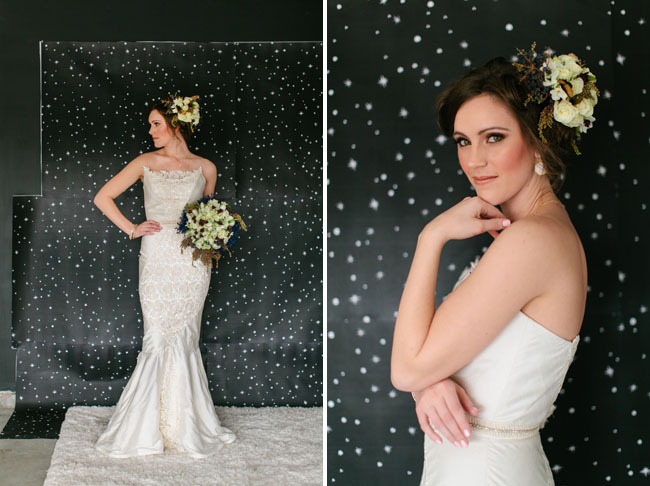 :) Thanks so much to Meg Ruth Photo for the photos and the inspiration for this fun shoot today! 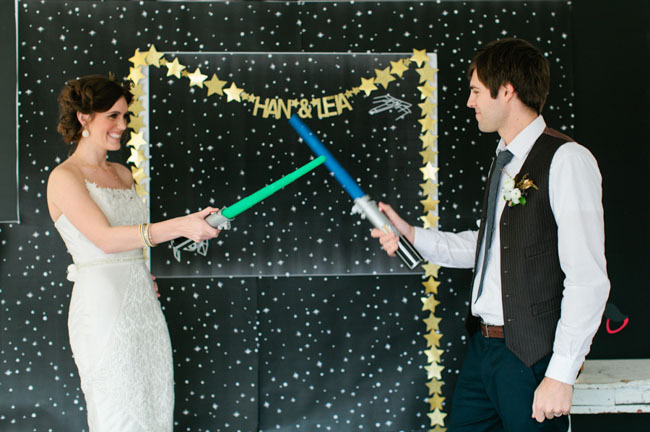 Five years ago I married a Star Wars geek. One year into our marriage I told him, “I think it’s about time I saw these Star Wars movies you’re so in love with so I understand what you’re talking about.” After Luke picked his jaw up off the floor and declared I was lucky he didn’t know about this “deal breaker” prior to our union, we watched the three original movies. Now, even though I might not be a Star Wars geek to the effect of my husband, I can appreciate his obsession. 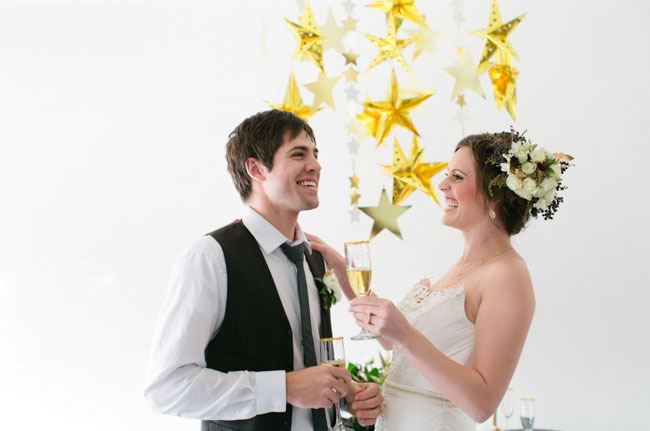 And on top of that, I wish I had fully understood the extent of his interest before we planned our big day. 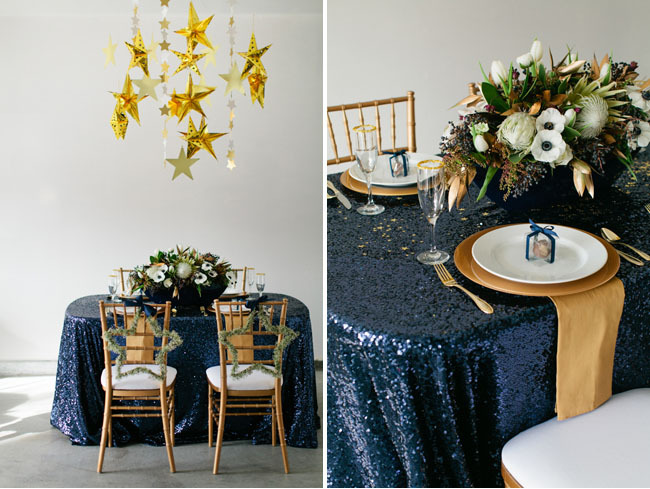 My whole goal in doing this nod to Star Wars with a Han and Leia wedding was showing women that they can include their future husband’s interests without making the entire event a themed kid’s party. Subtlety and classiness can be infused in between the tie-fighters and x-wings. Fifth & Hazel and Caravan Shoppe created this fun invitation to Han & Leia’s wedding on May 4th, because as true Star Wars geeks know, May 4th is Star Wars day. May the fourth be with you! The most well known characteristic of Princess Leia is, of course, the hair buns! And although doing a direct replication of the cinnamon roll-esque hair would be fetching, they decided on a modern bun on one side and a “bun” of flowers on the other. 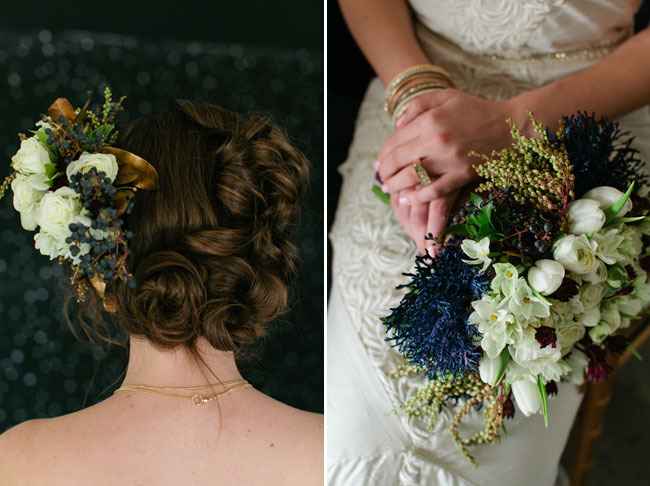 With the talents of hair and makeup team Your Beauty Call and the floral stylings of Layers of Lovely, the look came out perfectly. Tiffany from Peridot Sweets sculpted the phenomenal cake. 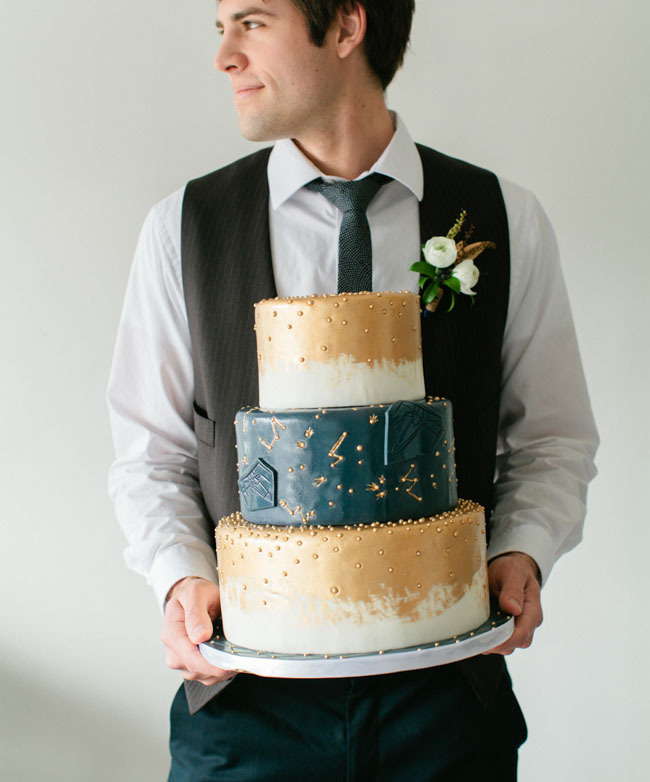 The three tier cake used Melanie’s Star Wars constellation design for the middle tier and a lovely gold brushed white fondant for the top and bottom layers. Love the I Love You. I Know print? 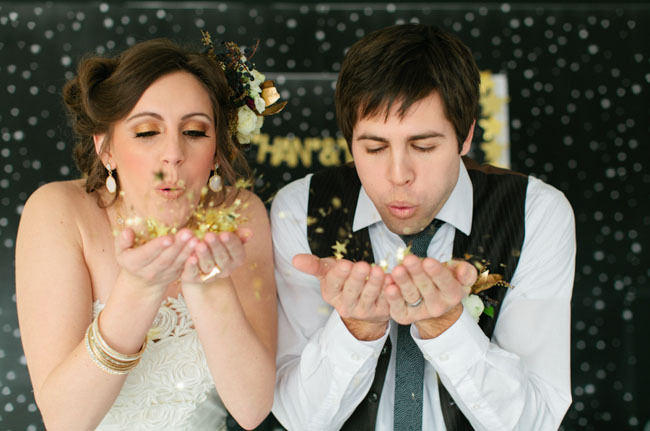 You can purchase a digital file from Caravan Shoppe for just $5 and use for your own wedding! 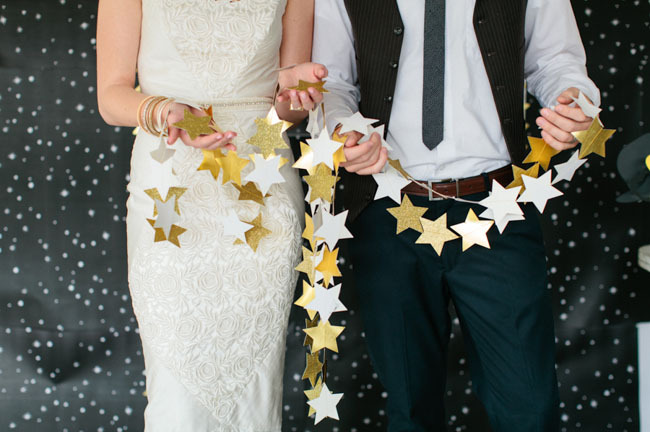 Love the star garland? 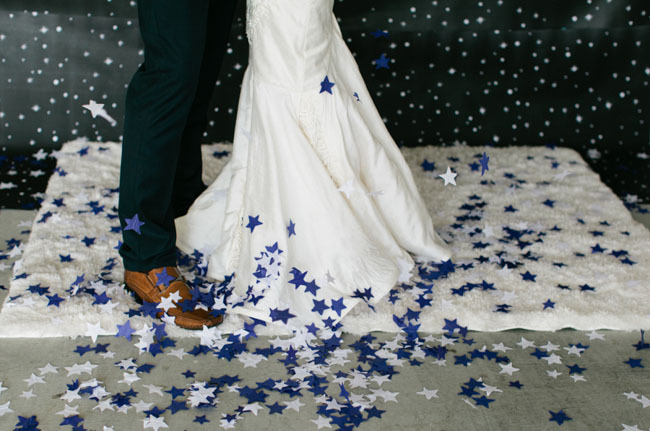 Check back in a bit as we are sharing a DIY for this! Thanks to all these creatives for sharing their talent with us today! 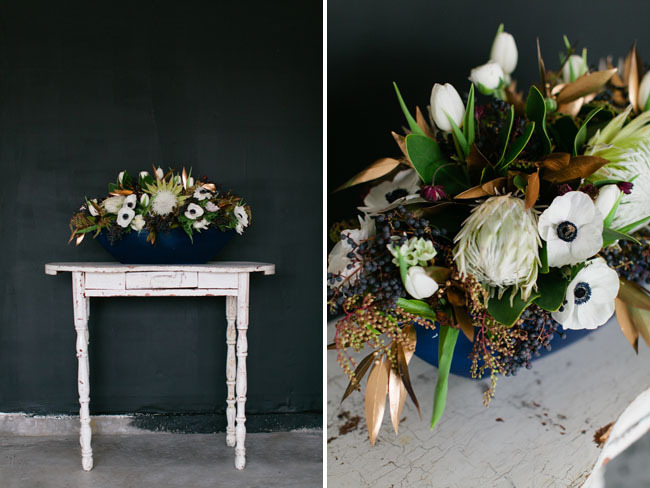 I LOVED everything about doing this shoot.I’m so grateful for all the amazing vendors that made this shoot possible. 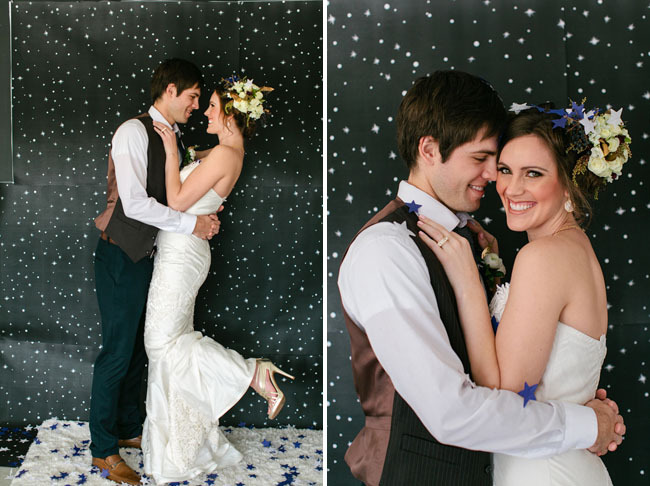 The models were incredible, I love real couples! Thank you so much, Jen! Your geek belief is appreciated! Absolutely LOVE this!! Beautiful shoot!! 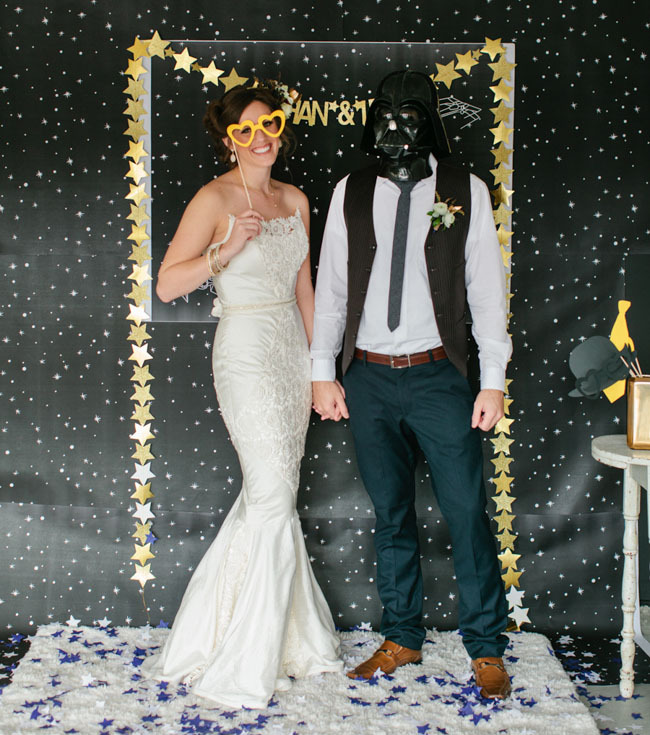 “What groom doesn’t love Star Wars” …really? 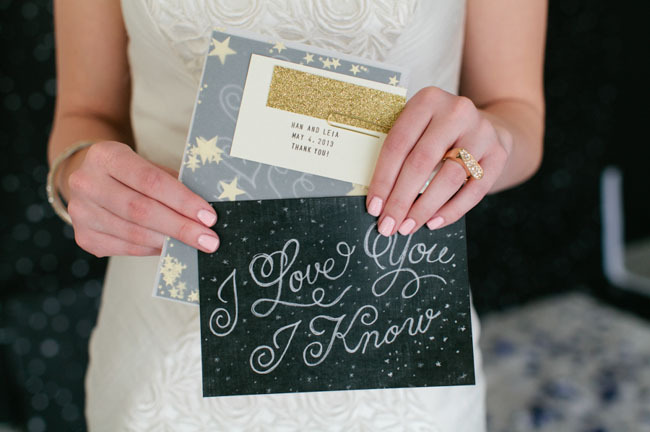 Lots of brides love Star Wars too! Regardless, this shoot is lovely and I like the more sophisticated take on a geeky theme. 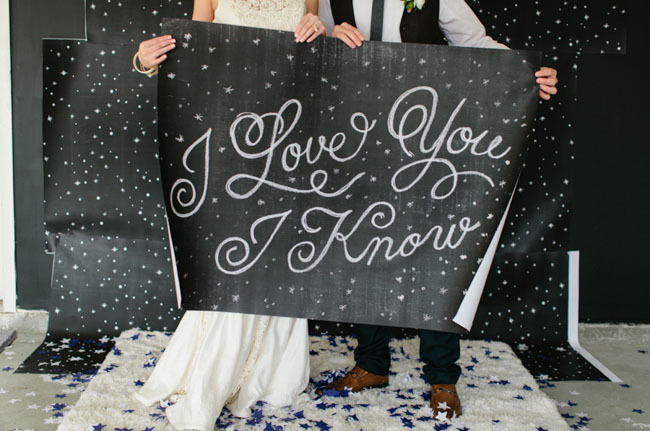 The “I love you / I know” banner is especially rad. Very cute! 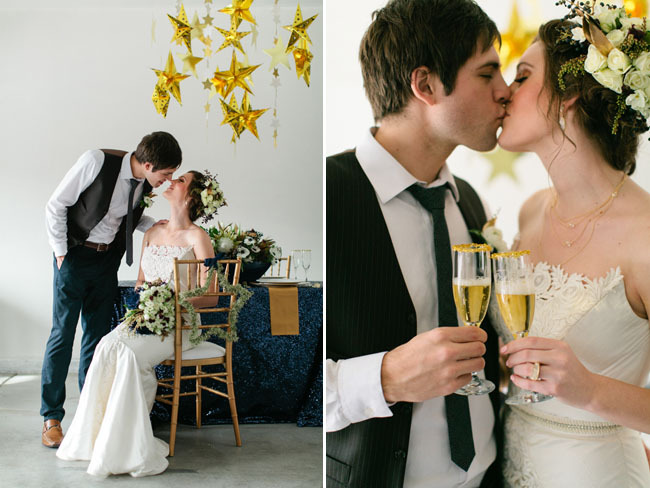 and very refreshing from a lot of the other wedding posts!! Love this shoot. Meg is so creative. Such a classy take on Star Wars. Love! LOVE the video! ..So cute! Great inspiration for Star Wars fans! This is way cooler than I thought it would be when first reading the title – they did an awesome job! Epic lines! What a great way to incorporate them, too. Oh my gosh… I’m not a big Star Wars fan, but this is amazing! Great shoot! Her hair flower is FABULOUS! 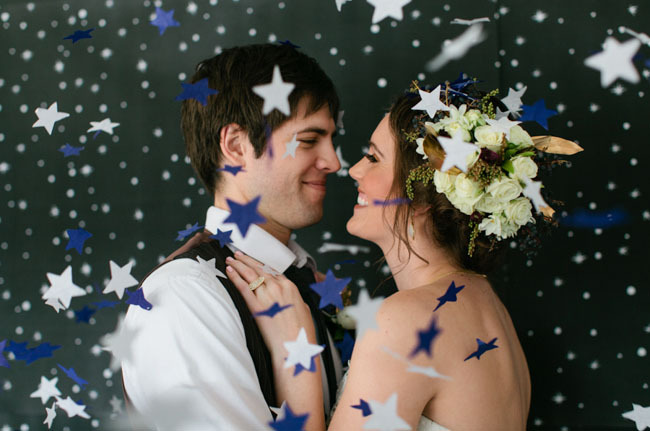 Big, giant star confetti is an AWESOME idea. And I was wondering how they were going to incorporate buns in her hair! They executed flawlessly! 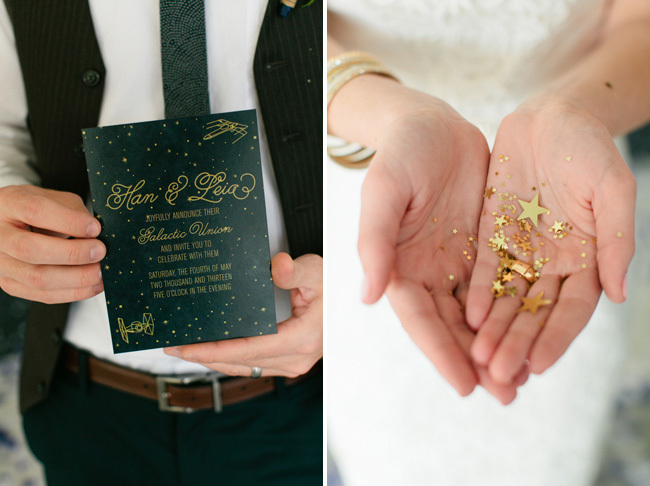 I want to know where to get the Star Wars theme invites! Those are wonderful and I have been looking everywhere for something like that! 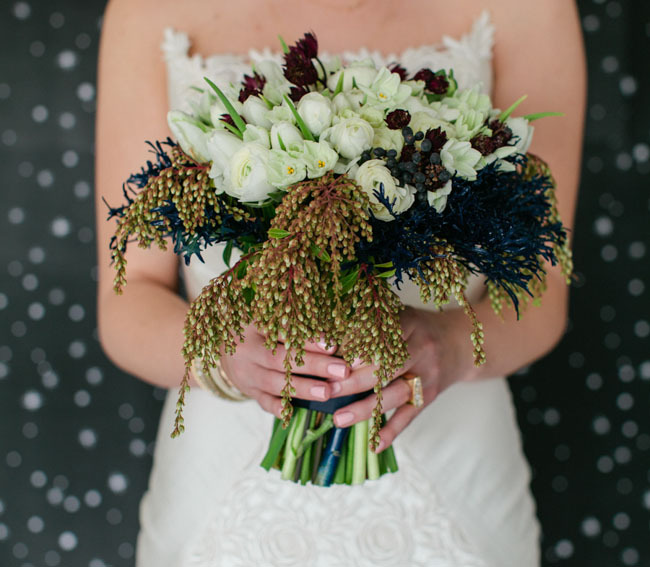 Love the colour theme navy blue and gold.